Get a personalized report card with actionable recommendations. Learn how Ivanti can help. IS YOUR SECURITY STRATEGY GDPR READY? Read, "Five Security Strategies for GDPR Compliance," today. The General Data Protection Regulation (GDPR) requires that organizations doing business with, employing, or collecting or processing EU citizens' personally identifiable information (PII) protect it. Unlike previous directives, GDPR makes the consequences serious for those who don't comply, including fines up to 20 million euros or four percent of global annual revenue. There's a long road to compliance ahead for most organizations. How do you begin? Start by taking our assessment to see where you stand. Assess risk through hardware and software discovery. Enforce policies to control user access and isolate vulnerabilities. Then secure your IT environment with tools to quickly respond to threats and manage compliance with reporting. Reduce risk and meet auditor requests. Get insight and visibility into your IT environment with automated and granular reporting. Detect, remediate, and respond when a data request or event occurs. Protect personal data from destruction, damage, or loss. Tools like patch management, application control, and privilege management can help. Implement GDPR policies to secure and manage PII throughout the employee lifecycle through IT automation and workflows. Determine your GDPR compliance risk with automated solutions to discover unknown assets, determine user access rights, and detect threats to personal data. A comprehensive GDPR strategy requires a mix of policies, processes, and technology. 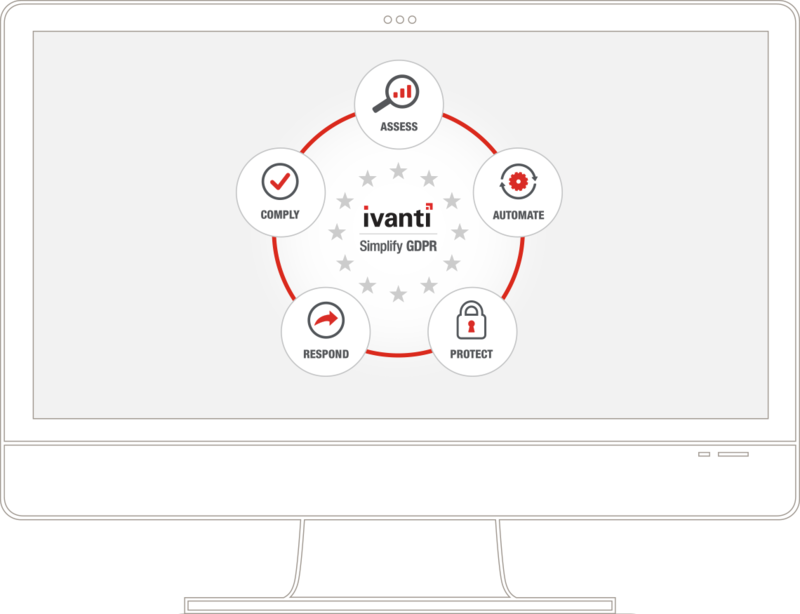 Ivanti's portfolio of software solutions is designed to make implementing your GDPR policies and processes easier. You can't protect what you don't know. Access tools to automate your endpoint and application discovery to protect PII on those devices. Get access to the dashboards and reports auditors need, streamlining the auditing process and helping you meet ongoing governance deadlines. Save time and eliminate human error by enforcing GDPR requirements with automated onboarding and offboarding workflows and remote user endpoint management capabilities. Keep malware from granting access to PII. Patch your OS and apps, keep unauthorized apps from running, protect against fileless malware, control admin rights, and enforce policies on removable devices. Put an end to silos. Bring together security, service management, and IT operations using solutions that help automate, integrate, and secure your digital workspace. CONTACT IVANTI TODAY TO DISCOVER HOW OUR UNIFIED IT SOLUTIONS CAN HELP YOU PREPARE FOR GDPR.